Sashimi - fresh, raw seafood, served with a dab of wasabi and a small saucer of soy sauce. The freshness of, and the texture of the fish is what makes all the difference. 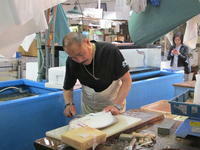 While visiting Tsukiji recently I watched the hirame being freshly filleted and readied for sashimi. 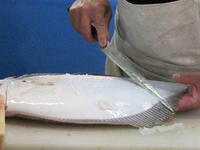 Hirame, the Japanese word for fluke or flounder, is a white flat fish. This fish was freshly filleted at 10 am and served at 6 pm in the restaurant. The hirame is not killed until it is sold. The fish is killed by cutting it under the gill. Although the fish has been killed, the nerves are still reacting and the fish twitches violently, which damages the flesh. This affects the flavour and the texture of the sashimi. The twitching can be quite strong and with sashimi quality fish, it is extremely important that the flesh on the fish does not get damaged. The texture and the taste of the fish will change if the flesh is bruised. 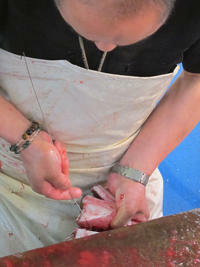 In order to avoid bruising the flesh, a steel wire is inserted into the mouth of the fish, along the spine of the fish. This process kills the spinal nerve and ensures there is no more twitching. The outer scales are removed from the fish. In addition, there is a thin layer of skin on the flesh of the fish which needs to be removed. Removing the remaining skin is done carefully with a very sharp knife. The knife is lightly scraped and skimmed on the flesh. 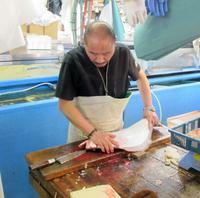 This ensures that all of the skin is removed and the fish is ready to be cut in sashimi size pieces.